I've written an 'adev', or AppleTalk Device, for classic Mac OS that works from System 7 through OS 9, that tunnels AppleTalk traffic over UDP to a server. I've written a server that lives on mac68k.info, and you can login with credentials obtained through that forum. There's a wiki page on how to use it. The 'adev' is a file that lives in your Extensions folder, and presents an AppleTalk device in either the Network control panel if you're running pre-OpenTransport networking, or in the AppleTalk control panel if you're running OpenTransport. When you select the device, it will put up a dialog asking for your username and password, and once connected, it's as if you're on the same localtalk network as everyone else that is connected. Other people's file servers appear in the Chooser just as they would if you were on the same localtalk network. 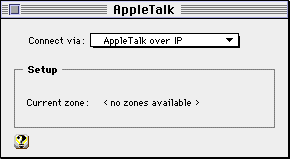 You can also play games with other players connected to the network, and use other AppleTalk software just as if you were on the same physical network. 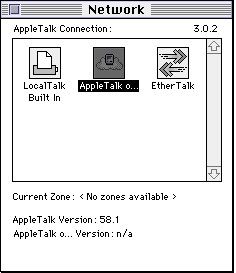 Anyone who is connected can setup a file server, just like if they were on the same physical AppleTalk network. However, there is an always available file server that shows up as "mac68k.info" which anyone connected to the network can access either as a Guest, or using their network credentials. The file server is actually a netatalk server running in an Amazon EC2 instance. I've written a special client for it that uses a 'tap' network interface, and written a netatalk 'uam' or User Authentication Module to authenticate users against the mac68k.info server. So, when you access this AppleShare server from your 68k mac, you are literally connected to The Cloud! You can use any AppleTalk enabled game on your Mac to play against other players on the network. However, there are some things to keep in mind. First, all the traffic is going over the internet, through the mac68k.info server, and not just on a wire in the same room like a normal LocalTalk network. This means latency, packet loss, and all the other problems associated with going over the internet, and most AppleTalk games were not designed with this in mind. So, it does work, just keep this in mind. The other thing to keep in mind is the network does a form of address mapping on AppleTalk node addresses. This means that programs which put the address of the computer into their network data will probably not work. One example of a game that does this is Bolo. The mac68k.info server knows about the Bolo protocol and attempts to fix up the packets on the fly, although support for this isn't perfect and is still being worked on. So, give it a try, and let me know if something doesn't work. It may be possible to fix the issue through server changes like with the Bolo protocol.